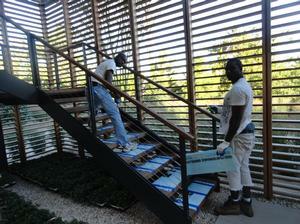 Biggie and Kevral lay foam boards to protect the stairs leading to this customer's roof garden. LiveRoof systems are designed to provide the best functioning, longest lived, and most easily maintained green roofs on the market. 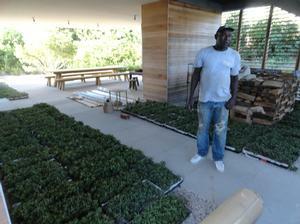 Plant varieties are selected specifically for rooftop cultivation, and have been tested to survive in that environment. 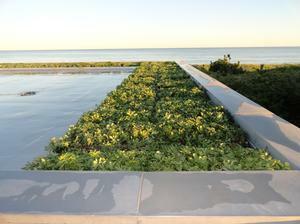 Every green roof is unique, and the LiveRoof system focuses on providing the plant material best suited to your climate and your personal tastes. Using these specific materials will greatly reduce the man hours spent maintaining your green roof, but there are unfortunately no plants that are truly "maintenance-free." However, these few maintenance hours will be highly beneficial in the long run. LiveRoof systems are proven to be financially beneficial when considering roof life extension and energy conservation. There is also the added environmental benefits to consider. Green roofs are not only adding beauty and livable space to your home, but can also help recreate habitats for butterflies, insects, and songbirds. Please visit www.liveroof.com for a more in-depth description of the benefits, specific plant varieties, and a look at the installation process of the LiveRoof System.